BlackBerry10 Review: Hot or Not? 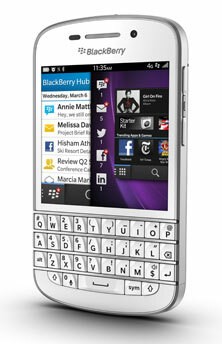 This is the vision of the world BlackBerry 10 offers. Minus the whole talking house and flying red armor. The idea behind this new mobile platform is to give you an easy and efficient way to display your communications as well as organize your digital world. And it does this job really well. The answer depends on one important thing: whether messages, emails and texts are your highest priority. Some people love their phones because they want to play games on the go, watch video and listen to music, or know what's going on with everyone on Facebook at all hours of the day. This is all possible with BlackBerry devices, but that doesn't mean this is the best platform for it. To understand why, let's first get to know BlackBerry 10. This operating system will be available on six devices this year alone, starting with the touchscreen-only BlackBerry Z10 and, a month later, the physical keyboard-bearing BlackBerry Q10. At first glance, BB10 looks very much like many other modern mobile platforms and does utilize some of their best tricks. The thing that makes BB10 stand out is the Hub. 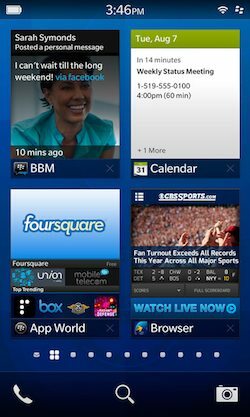 The BlackBerry Hub is so important to BB10 that it is accessible from any screen or app with just one swipe. The reason it's central is that BlackBerry is, at heart, all about messaging. Thus, the Hub serves as a universal Inbox where you get email, BlackBerry Messenger, Twitter, Facebook, LinkedIn, texts, calls, and even chats all in one place. And despite how crowded that seems, the way the Hub arranges things it doesn't feel chaotic. It's easy to filter by one service at a time, but looking at everything together has benefits. The Hub isn't a place for looking at your Facebook Timeline or Twitter feed, it just alerts you to messages and updates specifically for you, such as a Facebook message or @ reply. However, you can post a status update from within the app. Events and appointments are also available via the Hub, and opening them reveals more information than just time and place. Calendar entries show other participants, who has RSVPed, emails associated with an event, even past events with the same people. This pulls together all the information you need for a meeting and keeps it close at hand. That weaving together of messages, contacts, and events is something other platforms halfheartedly try to do, but never quite succeed at. For people who need this kind of tight integration in order to stay organized, BlackBerry 10 is very attractive. The overall interface is called Flow, and it's aptly named. Flow is also all about efficiency, thus it operates on swiping gestures. Swipe up to minimize an app or to peek into the Hub to glance at newly arrived messages. Swipe up and right to fully open the Hub. Swipe down from the top to access settings or menu items. The whole thing does flow together quite nicely and doesn't take long to master. Each time you minimize an app it becomes an Active Frame, ready for you to pick up where you left off. The full list of apps is just a swipe away. While there are no widgets, as on Android, the Frames update with real-time information where applicable. 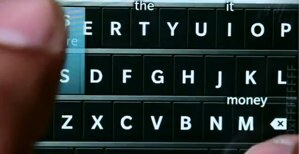 BB10 handles the multitasking aspects of the interface well. So what might hold a mainstream user back from plunking down money for a BlackBerry device? That depends on how much you need the other features offered by Android and iPhone, starting with good apps. BB10 comes with some useful apps geared toward productivity, and its app store, BlackBerry World, currently has over 70,000 compatible apps. That number includes some top tier apps, just not that many of them. Overall, BlackBerry World lacks the focus and clarity of the platform as a whole. And because the platform is technically new, the same problems that plagued Android and Windows Phone in the early days appear here, as well. Those problems include not enough top tier apps and developers, a lot of fluff apps, just plain terrible apps, knock-offs of popular Android and iOS apps, the list goes on. 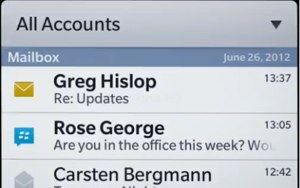 For people who need (or want) to keep their work and personal lives separate, BlackBerry offers the Balance feature, which allows users to have two profiles (different apps, different messaging accounts, everything). That is, if you or your company have a Blackberry Enterprise server. If not, Balance isn't available. In a way, this is the core challenge BB10 faces in luring non-business users. There are some great features here, many that would appeal to anyone, yet they ultimately appeal most to people in corporate environments. Unfortunately, BlackBerry 10 isn't compelling except for the message centralizing feature of the Hub for the general consumer. If the app selection improves down the road, there is an opportunity for BlackBerry 10 to become more well-rounded, as iOS and Android have become. However, given that the core of the audience is business users in corporate environments, there's little incentive for developers to flock to the platform if the audience doesn't expand. BlackBerry 10 is a capable, well-designed operating system. If messaging and keeping in contact is your highest priority, then it's worth checking out the new hardware that will run it. If you need your smartphone to do more, this may not be the environment for you.